Lone Mountain Truck Leasing offers lease-to-own sales on new and used semitrucks. For truck drivers looking to become owner-operators, Lone Mountain will consider your credit history and your work history — not just your credit score — when deciding whether or not to approve you for a lease. Below, we have what you need to know about Lone Mountain Truck Leasing’s credit requirements. Lone Mountain Truck Leasing helps truck drivers who may not have perfect credit buy a semitruck. Through its lease-to-own program, Lone Mountain makes new and used semitrucks available. Lone Mountain is not concerned with your credit score when you apply for a lease, various sales associates said. Instead, Lone Mountain will review your credit history for negative records like tax liens, bankruptcies, back support payments, and collection accounts. If your credit history is relatively free of negative marks, you will likely be approved. Lone Mountain also considers your driving experience, work history, and carrier. 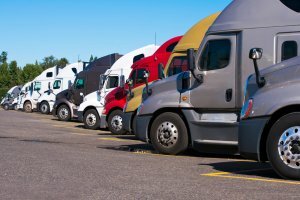 Truck drivers with strong work records can typically qualify for a lease — regardless of your credit score. Lone Mountain uses its in-house finance company, Cresco Capital, to review your records. The company will work with you to determine a reasonable down payment and monthly payment terms. Once you’ve made your final lease payment, you will receive a clear title to your truck. Lone Mountain Truck Leasing has five dealerships located in Las Vegas; Carter Lake, Iowa; South Holland, Ill.; Tifton, Ga.; and Fort Worth, Texas. To learn more, visit Lone Mountain Truck Leasing’s website. Truck drivers with less-than-perfect credit may be able to lease-to-own a semitruck through Lone Mountain Truck Leasing. Lone Mountain bases its lease approvals on your credit history and work history — not just your credit score. For more information about truck driving and leasing, see our articles: Semitruck Leasing Programs: No Credit Check Required and Large Companies That Offer Company-Paid CDL Training.